Do you dream of improving your smile but feel too self-conscious to be fitted with conventional braces? If so, the ‘invisible braces’ from Invisalign will be sure to put a smile on your face. 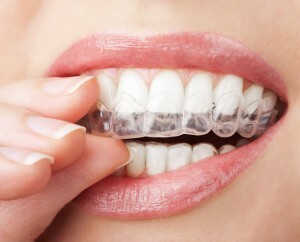 Invisalign is an innovative dental treatment which straightens teeth using a series of clear, removable aligners. Each bespoke aligner is individually molded for you and replaced every two weeks, moving your teeth gradually until they are in the perfect position. And because every aligner is almost invisible hardly anyone will be able to tell you’re even wearing them – allowing you to achieve the smile you always wanted with confidence. Our specialist orthodontist will examine your teeth before using the latest 3D technology to provide a computerised image of your mouth. Your dentist will use this digital picture to map the movements of your teeth during each stage of the treatment from start to finish. These details are then sent to Invisalign to create a series of custom made removable aligners for you to wear. Each aligner is slightly different, moving your teeth gradually into the desired position before being changed to the next aligner every two weeks. Invisalign only works while you wear the aligners so we recommend aligners should be worn day and night, except when eating, brushing or flossing teeth in order to complete your treatment in the timeline outlined by your dental practitioner. The amount of time you will need Invisalign will vary depending on the movement needed to fully straighten your teeth however the average treatment time is between 9 and 18 months. During your treatment you will come in for checkups every four to six weeks to allow your dental practitioner to monitor your progress and provide you with your next series of aligners. As the treatment progresses, you will notice a gradual movement in your teeth, slowly transforming into a healthy smile by the end of your treatment time.